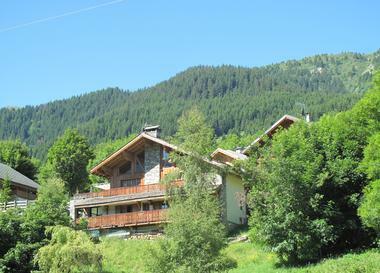 This splendid chalet is located In a residential hamlet, five minutes away from Méribel and served by a cable car. Upstairs, the living-room under exposed framework has a high ceiling. It is the perfect place to relax in front of a stone fireplace, or to eat with friends in the dining room area, separated from the kitchen by a sliding glass window. Coming all with private bathrooms, the five bedrooms include 12 beds. From their balcony, certain rooms enjoy unobstructed view over the valley. "Well-proportioned, perfectly designed, with an elevator, this chalet offers noble materials, and services of high quality," says CIS Immobilier. Served by a ski slope, this property also includes : a spa area with a hammam, a sauna, a massage room, a movie theater and a double space parking. It is sold furnished. VAT recovery system is available.